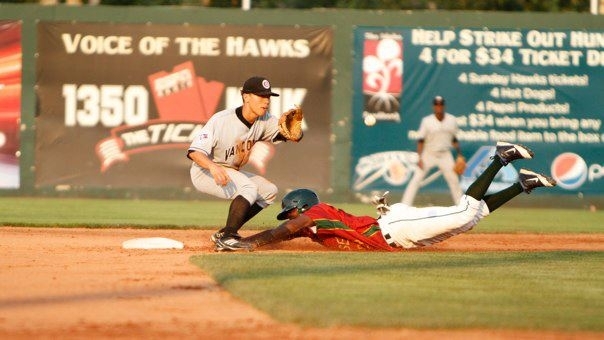 Trey Martin has been with your Boise Hawks for just about three weeks now and has already made a growing impression on the fans here. He was a 13th round draft pick in 2011 and played in Mesa last season and the beginning of this season. Known as a defensive player, Trey has been stepping his batting game up since being in Boise. Trey misses his family, friends, his house, and Zaxby’s. “Zaxby’s is a fast food place that serves chicken and chicken fingers. I eat there about 2-3 times a week back home.” With the excitement in Trey’s voice I asked if that would be his first meal back home, “ABSOLUTELY, it will be in the car that picks me up from the airport!” So if you see Trey around, point him in the right direction for some good chicken in Boise! If we had known before we flew in from GA last week that you liked Zaxby’s so much, we would have brought you some!! Hunter loves Zaxby’s too! !